По звуку этот альбом альбом Рэда Холлоуэя, пожалуй, один из самых запомнившихся для меня. Пример прекрасной записи 1960-х годов. Спасибо, ildarrrr, за эту пластинку! This is Red Holloway’s fourth album for Prestige Records, and it shows very clearly two of the musician’s exciting facets. On five of the tracks, he plays in today’s bluesy, rocking, driving idiom. And with a gutty concept and sound completely his own. On the other tracks, he brings his jazz sense into full play and improvises brightly and deftly in and about a quartet of themes. Red was born in Helena, Arkansas, but was raised both physically and musically in Chicago. Among his schoolmates and horn-mates were such eminent Chicagoans as Johnny Griffin and Gene Ammons. He went to school in Michigan with Sonny Stitt. The company may have been heady and fast, but Red was always able to hold his own and make his sound heard, too. He studied at Dusable High School and the Chicago Conservatory of Music. His primary horn is tenor sax, but he always plays alto and a bit of flute. Among the very first professional jobs he had was one with bassist Gene Wright’s band back in the mid-1940s. He has also played with the bands of Lionel Hampton, Lloyd Price, Bill Doggett, and for the last two-and-a-half years, in Brother Jack McDuff's swinging combo. For these sessions, Red used two groups. One was a rocking quartet driven by Lonnie Smith’s organ. The other was a snapping jazz group, sparked by the Norman Simmons trio with Simmons the piano soloist. George Benson, one of Red’s favorite players, takes the guitar solos on the sides that also feature Smith’s organ. “I enjoyed the cooperation of the musicians,” Red noted. “We got a good feeling together in a short time. You know, some times you have to have played together a long while to get this good feeling going. 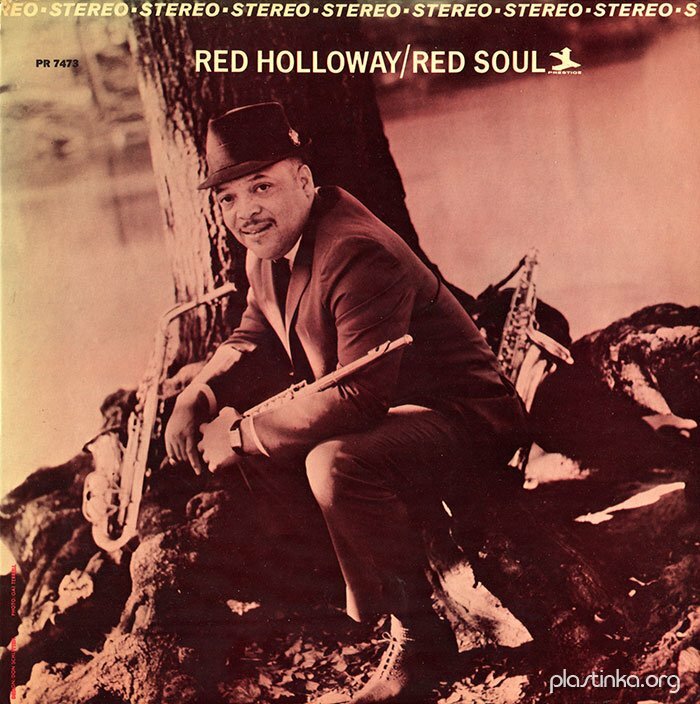 Red unlimbered his alto for that haunting track, and proved again that even a hard-blowing cooker like Red Holloway can sing a ballad on his horn. The other jazz pieces feature solos by Red and pianist Simmons. Eagle Jaws is taken at a moderate clip, while I’m All Packed has an intriguing rhythmic pattern to it. The Regulars is up tempo, and it sizzles all the way. The other tunes are swinging rockers, brightened by the interplay of Red on tenor and Lonnie Smith on organ. Note the preaching style they give to Good & Groovy, and the humorous waddle they tack onto Big Fat Lady. And there’s also a sense of discovery. After all the years on the road, Red has discovered that his 17-year-old son, Binky, is an accomplished guitarist and, in fact, a teacher of guitar at a Chicago studio. Is there a father-son Holloway album in the future? The apple, they say, never falls far from the tree.